Are you considering taking a few college courses or completing a degree? Today there are a variety of choices available and understanding and investigating each option can be daunting. So how do you decide what kind of educational program is right for you? • Understand the types of education available. Most education is offered in one of three formats: credit courses, noncredit courses or technical training. If you are interested in taking courses toward the completion of an undergraduate or graduate degree or for college credit, you want to consider educational programs which offer courses for academic credit. If you are more interested in updating your skills for professional development within a specific area, consider noncredit coursework or certificate programs. Want to move into a technical field such as radiologic technology or practical nursing? Depending on the field, you may need training within a certificate or diploma program. • Establish practical criteria. Think about issues of timeframe, schedule and finances. • Do you have a timeframe in which you want to reach your goal? Realistically identifying the amount to time you have can help you to eliminate educational options you won’t have time to complete. • When are you able to take courses? Depending on the educational program, courses may be available during the day, evening, weekend or online. Online courses often afford the greatest flexibility, as most programs allow students to access courses when they are able during a given week. Knowing what option fits best with your schedule will help you to narrow the choices. 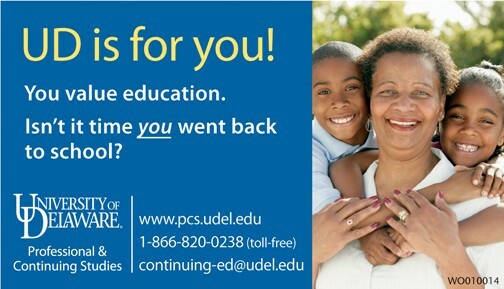 • What finances do you have available for education? Will you need financial assistance? Knowing the cost and financial assistance available for each educational program can help in the decision process. • Research educational programs which match your criteria. Searching the Internet for programs that fit your criteria is a great place to begin. For instance, the Delaware Higher Education Office website (www.doe.k12.de.us/infosuites/students_family/dheo/) lists all the colleges and universities in the state and offers information on financial aid. Once you have identified programs of interest, how do you make the final decision? Often, programs allow you to schedule an in-person or phone appointment to answer your questions or offer information sessions regarding their programs. Talking to others who have completed the program or attended the school can also be helpful. The University of Delaware’s Division of Professional & Continuing Studies ACCESS Center can assist with helping you decide what kind of educational program is right for you. Michelle Parnell and Susan Boudreaux are advisors in the University of Delaware ACCESS Center. For information, or to make a free appointment with an academic advisor, please call 302-831-7600 or write to access-advise@udel.edu. ← Previous Story True or False?